Performance Metals manufactures Anodes for Sterndrives, Shaft Drives, Hulls, Water Heaters and Heat Exchangers. What makes Perfomance Metals more than just another Anode? Zinc is the most common sacrificial material. 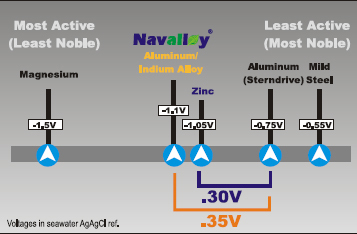 Performance Metals developed Navalloy (aluminum alloy) as an anode. Navalloy is specially formulated to provide maximum protection and longer life and meets military specification MIL-A-24779. Navalloy includes 5% zinc and a trace of Indium, which prevents the build up of an oxide layer when stored out of the water. Navalloy alloy anodes provides more protection and last longer than zinc anodes. It is the only anode that is safe for all applications, in freshwater, brackish or saltwater. The anode reactivates after exposure to air, unlike zinc. Take the guess work out of when to change your anode. 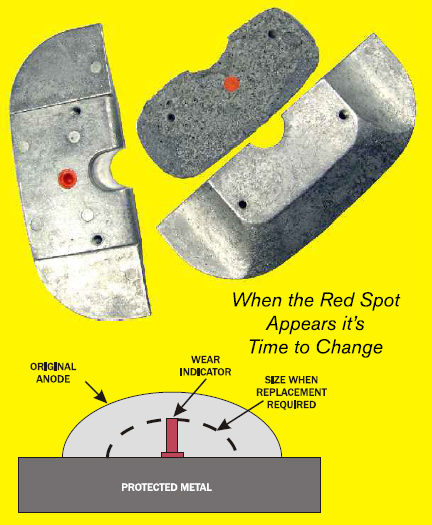 Patented wear indicator is a plastic indicator that is embedded in the anode. Visible when the anode has worn to half it’s original size. Navalloy should not be confused with other Alloy Zincs. Magnesium Anodes are entirely different than the Performance Metals Navalloy Aluminum Alloy Anode. Magnesium is the most active metal on the Galvanic scale; it can be used in freshwater, but care must exercised. Magnesium can over-protect aluminum hulls or out-drives in salt or brackish water or even polluted freshwater, causing paint to be lifted with resulting corrosion. Even a few hours immersion in anything other than clean freshwater can cause surface corrosion damage. Ensure that a good electrical contact is made between the anode and the metal that you are protecting. Use new stainless steel fasteners with anodes. Performance Metals supplies SS install hardware. Use an anode that fits your application and offers adequate protection. Inspect anodes regularly, change them when they are 50% worn. Do not pain anodes or the surface you are attaching an anode to. Never mix anode types; Navalloy anodes will try to protect zinc anodes! Never use zinc anodes on aluminum out-drives. Do not use Magnesium anodes on anything other than on out-drives used in freshwater.